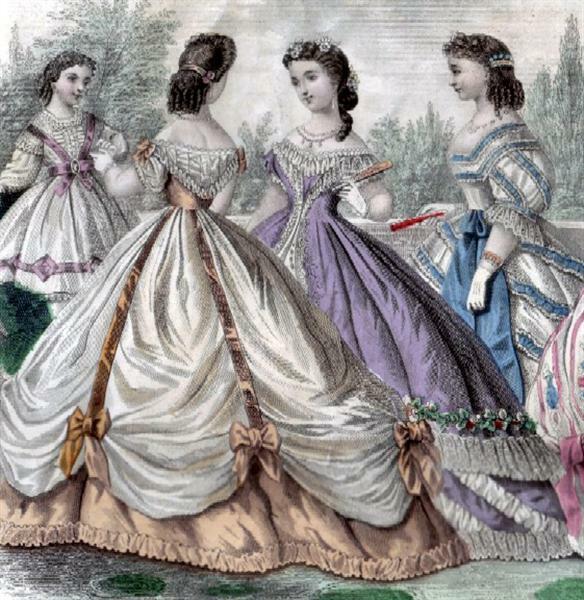 This era was one where ladies fashions saw the transition from a style where bell-shaped skirts were supported by a multitude of petticoats (see 1854 illustration, left)to the introduction of the cage crinoline or hoop-skirt as skirt support. Flounced skirts were quite popular in the 1850s; in the late 1860s skirts became elliptical. Ladies’ evening gowns of this era typically consist of a full gathered or pleated skirt (usually 115″-140″ at the hem), a fitted bodice with rounded open neckline and short puffed sleeves. In the early 1850s they would have been worn over starched petticoats, after around 1856 they would have been worn over a wired hoop (105″-125″ bottom hoop circumference on average). The bodice is usually fastened at the center back by either hooks and eyes or lacing. The look of the bodice was usually longer waisted in the 1850s and becoming more short waisted throughout the 1860s. BODICES: FIT:The bodice fits smoothly wthout straining across the body or shoulders. NECKLINE: The neckline is open, just to the turn of the shoulder (lower cut in Europe), the armhole is slightly dropped. The neckline is usually finished with a tucked net trim or eyelet edging and has a drawstring for a snug fit. WAISTLINE:The waistline is either pointed in front and back or straight; points are more common earlier in the period, straight waistline appears more often late in the period. Princess-line gowns are cut with the bodice and skirt in one piece, not extremely common. CLOSURE: The closure is in the center back, especially when the waist is pointed, with either lacing (most common) with hand sewn eyelette holes or hooks and eyes. Front hooks or buttons are sometimes seen. SLEEVES: Sleeves are short and are usually puffed (single, double, or triple), or a ruffle with puff beneath. Sleeves usually have an undersleeve of white net or easily washable material. TRIM: The neckline trim is often called a berthe, and is pleated horizontally around the neckline; ruffles, ribbon, lace, sashes, or sheer net fichus are also popular. The neckline, armhole, and waistline are all usually edged with fine self piping. LENGTH: Skirts are full length, sweeping the floor for day wear and a bit shorter for dancing (the more experienced the dancer the longer the skirt can be). WAIST FINISH: The waistline is gathered or pleated in several combinations: pleated in front and gathered in back; gathered all the way around; layered box pleats; pleats all the way around. SHAPE: The shape of the skirt is bell shaped in the 1850s and early 1860s, transitioning from a petticoat supported skirt to a crinoline (cage or boned skirt) support. Throughout the 1860s the shape changed from bell to an elliptical shaped, ending the decade with a conical skirt with more fullness towards the back. FULLNESS: The skirt should have enough extra fullness to allow it to fall gracefully over the hoop. A skirt that is not very full will show the lines of the hoop’s underneath. PETTICOAT/UNDERSKIRT: An over-the-hoop petticoat is recommended, especially for sheer fabrics. HOOPS: Hoops were generally smaller for day wear than evening wear. The size of the hoop ranges from around 115″ to 150″ in circumference depending on things like height, level of society, or formality of occasion. The width of one’s hoop should be chosen to harmonize with a lady’s height. A lady of 5’ 2” might choose a hoop of 110-120” circumference, but a lady 6’ tall might have her hoop at 150” around. It is best to avoid a hoop that is too large and will not fit into the ballroom. 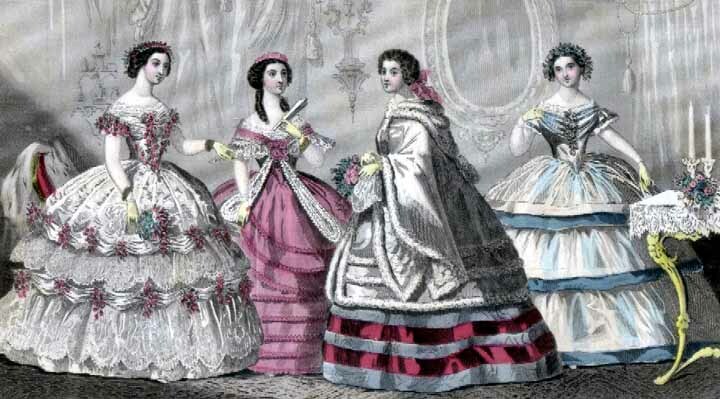 FABRICS: Fabrics used were most often silks in taffeta, moire and lightweight jacquards or brocades; for summer wear lightweight organdies, various open weaves and cotton muslins were popular. PATTERNS: patterns Can be solids, stripes, small prints (both allover and border prints) or plaids. Embroidered degigns are also seen. COLORS: Colors are generally lighter for young ladies, darker for older women. Bright red should be avoided, as should black (in America), unless one is in mourning, and very dark colors. TRIM: The gown can be decorated with contrasting or complimentary trim and black or white lace. Decorative elements (ruffles, bows, geometric designs, flowers, etc.) on the bodice and skirt usually matched, with the skirt decoration reflected on a smaller scale on the berthe (neckline trimming, see illustration) of the bodice.